I was not somebody that enjoyed eating steak as a child, as a matter of fact my mom would make me hamburgers on “steak” night as I just didn’t enjoy eating steak. As a grown woman, I ordered a “prime rib” cut of meat and usually asked for an end cut because that’s what I was introduced to by my former husband and I always enjoyed it. I was not the girl who ventured out to try other cuts, outside of a filet mignon, because the prime rib worked for me and so I left it at that and I never cooked steak at home because we just did not do a great job at it. I wanted to learn more about steak and I thought back to culinary school as the best part about going to culinary school was learning that I needed to try everything to understand what I liked and how to make it. We marinated the steaks in a bag, we used the same ingredients for both steaks, both steaks were in the same bag and I kept flipping the bag to make sure each steak was equally covered in seasonings. 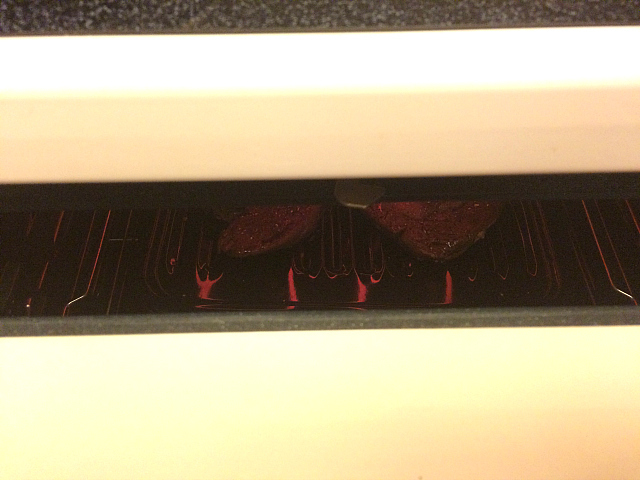 My oven was on “broil – high” and so we kept the door lodged open just slightly while the steaks were cooking (I would have cooked them on a BBQ but I don’t own one and the oven did just fine). If your door does not stay opened like mine did, just use a potholder or a wooden spoon to keep it opened. As you can see both steaks cooked up lovely and both steaks were cook “medium rare”. 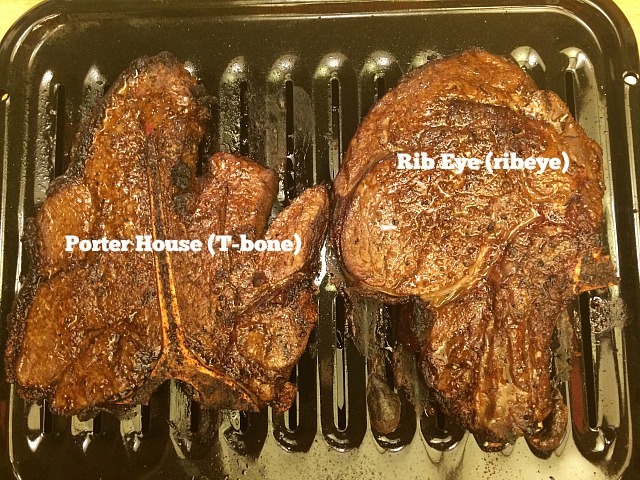 And now the taste test, I took a bite of the porter house and then the rib eyed steak…MmmmmMmmmm they both were amazing!!! In one bite, I did not have my answer so, I took another bite of both steaks then another bite as I really wanted to understand the texture and flavor of both cuts. 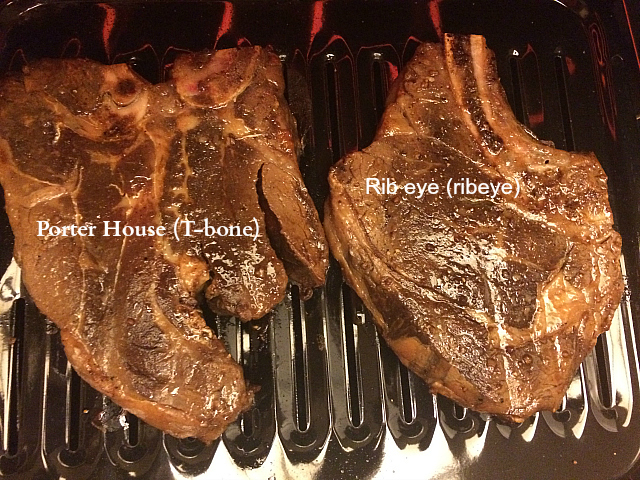 While both steaks were cooked up perfectly and had an amazing flavor, for me, I found the porter house (t-bone) steak to have more flavor and it just melted in my mouth. 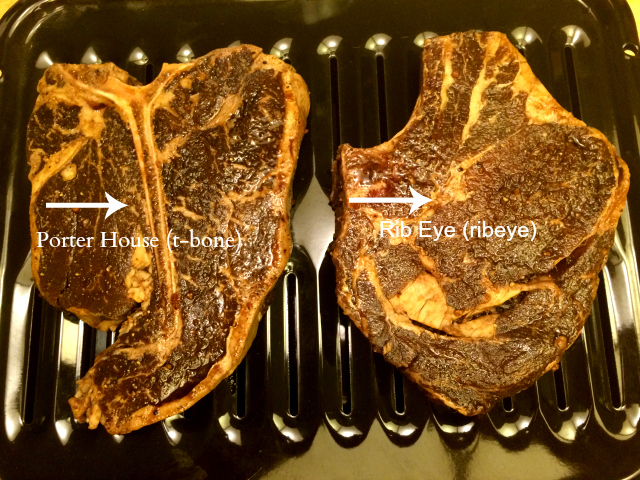 This was a perfect test for me to do at home as it really allowed me to see the difference in flavor and texture in both steaks. 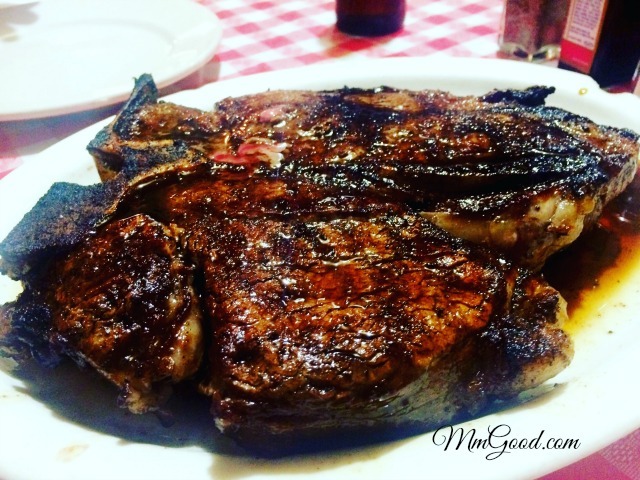 For me, I would order the porter house (t-bone) steak over the rib eye or even the prime rib as I really did enjoy it more. And for those of you who have leftovers, steak and eggs, it does not get any better then that…YUMMY!